Have you lost Paradise in your heart? Paradise Lost. 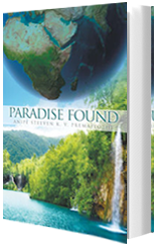 Paradise—the Garden of Eden—was lost due to the sin and disobedience of the first Adam. Because this Paradise literally disappeared from the earth and history, we are left to wonder, where was the Garden of Eden? This has been a challenging issue to both Christians and non-Christians. 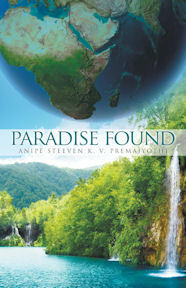 In Paradise Found, Anipe Steeven Premajyothi shares what he believes to be God-revealed truths about the geographic location of this lost Paradise. Through the Spirit of God, may the words of this book help restore Paradise in your heart. With a deep burden for lost souls in India, Anipe Steeven Premajyothi (M.Div., Asian Theological Academy in Bangalore) partners with local organizations and churches in traveling to rural villages to spread the Good News about Jesus. In full support of him is his wife, Vijaya Kumari; his daughter, Jyothi Threressa; and his son, Jessie Hemanth. His son, Samuel Sumanth, went home to be with the Lord in 2008. 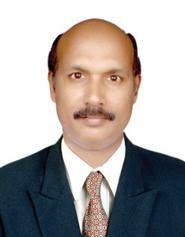 Anipe currently lives in Samalkot, India. Please pray for his ministries in India. 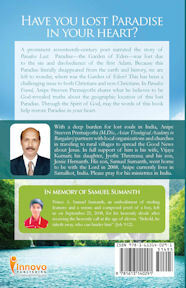 The book is published in memory of Samuel Sumanth. 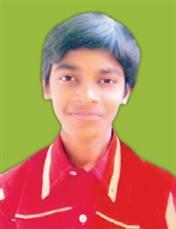 Prince A. Samuel Sumanth, an embodiment of sterling features and a serene and composed jewel of a boy, left us on September 25, 2008, for his heavenly abode after receiving the heavenly call at the age of eleven. "Behold, he taketh away, who can hinder him" (Job 9:12). Prince A. Samuel Sumanth, an embodiment of sterling features and a serene and composed jewel of a boy, left us on September 25, 2008, for his heavenly abode after receiving the heavenly call at the age of eleven. “Behold, he taketh away, who can hinder him” (Job 9:12).